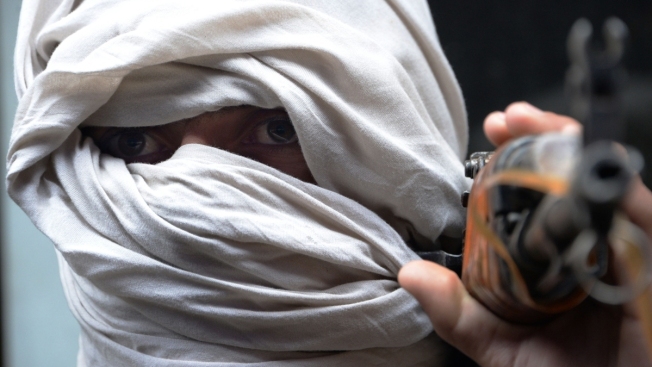 This Jan. 12, 2016, file photo shows an Afghan former Taliban fighter carry his weapon before handing it over as part of a government peace and reconciliation process at a ceremony in Jalalabad. U.S. officials are sitting down with former members of the Taliban as they try to wind down America's longest war, three Taliban commanders tell NBC News. The sources said the talks took place in Afghanistan, Qatar and the United Arab Emirates. One negotiator said "never more than five" Americans attended a series of hotel suite meetings in Doha, Qatar. The Taliban delegates took steps not to be identified by other countries' intelligence services, the negotiator said. He and the other sources spoke on the condition of anonymity because they were not authorized to speak to the media. NBC News could not confirm the Taliban officials' accounts. A State Department representative didn't confirm the meetings but did say the Trump administration is eager to resolve the conflict. U.S. officials indicated this week that the administration is open to direct talks with the Taliban.